Artist Maxine Miller designed this stunning Mermaid plaque based on the legend of the Goddess Aine. 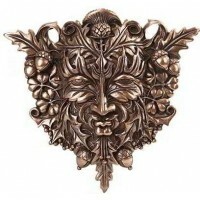 In bronze or stone finish, it is a gorgeous piece. The Goddess Áine has three forms: a mermaid, a young woman and a hag. As a Celtic mermaid she lives at the bottom of Lough Gur (Enchanted Lake). As a young woman she is a powerful creative goddess, who made the fairy people and gave life to the earth. As a hag she defends her realm under the lake. Lough Gur in County Limerick, is a magical and mysterious place that is rich in folklore along with a wealth of archaeology and history dating back to Stone Age times and has been an important place of worship for over 6,000 years. The hill of Knockainey (Irish: Cnoc Áine), near Lough Gur, is named after her. There is also an ancient Solar Wheel, as well as a sun temple, on the shores of Lough Gur as Áine is also associated with the Sun and Summer Season. One day, the Earl of Desmond found Áine in her Celtic mermaid form combing her hair by the lake. He snuck up on her and stole her magic cloak, which put her in his power. She agreed to bear the Earl a son in exchange for her freedom. This boy grew up to be exceptional in every way, once jumping into and out of a bottle. Later, due to a curse, he was condemned to spend eternity under the lake with his mother. It is said that once every seven years Lough Gur dries up and you can see the sacred tree at the bottom of it. The tree is guarded by Áine in her hag form, while she knits the fabric of life. A man on horseback once tried to steal her cloth, but Áine made the waters of the lake retrieve the cloth, and a part of the horse as well. The King of the Gold Mines was once accused of adultery by his wife-to-be because he was given a present by Áine. In her Celtic mermaid form she has made a likeness of him out of magic seaweed. The story ends tragically when the king is killed and his betrothed dies of grief. Mermaid Áine changed the lovers into two trees that grow together. This stunning work by artist Maxine Miller is finely detailed cold cast resin measuring 12 inches high. Item Number: PT-11838/11839 | Approximate Size (Inches): 7.75 wide x 1.50 deep x 12.00 high | Approximate Shipping Weight: 3.00 lbs.